As is the case with most occasion wear, evening gowns often need alteration to ensure a perfect fit. Evening gowns are required to be worn at numerous occasions and it is important to have a gown which sits properly and is the right fit for you. Evening gown alterations may be needed when attending special occasions such as races, weddings, christenings, formal events or dinners. Altering a gown can modify it to suit the occasion being attended and also restyle it if necessary. 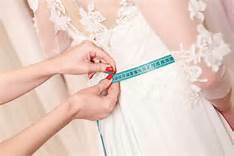 By having a gown professionally altered and using exact measurements, it can be tailored to suit your figure and height and adjusted accordingly. Having a properly altered gown will mean that your dress looks at its best when worn and that it fits correctly. Evening gown alterations can be done neatly and without causing damage to the dress as adjustments can be made to the length and sizing of the gown without leaving any noticeable traces. Bead work can also be added to an evening gown, as well as most extra detailing that may be desired. In this way you can customize your dress to suit your own personal taste and style. Evening gown alterations can bring older gowns up to date, meaning you get more wear from a favourite gown. By having an evening gown altered, you can have the dress styled to suit your precise needs. Adding beading or detailing also creates a personal touch which reflects your own style, making the gown uniquely yours.